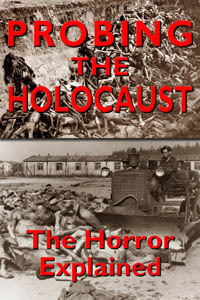 "The Holocaust" is widely known as the murder of six million Jews by Nazi Germany, many if not most of them in gas chambers deceptively disguised as shower rooms. We have all seen the terrible imagery of dead prisoners taken after concentration camps were liberated. This documentary reviews some of the most memorable of these images, which were taken in camps such as Dachau, Nordhausen and Bergen-Belsen. A closer examination of this imagery we've all been exposed to tells a very different story than what we were made to believe. Surprisingly, a large number of the bodies we were shown were the direct result of Allied bombing and strafing attacks, rather than victims of a systematically planned Nazi extermination policy. Probing the Holocaust: The Horror Explained (Part 1) presents surprising information which sheds a new light on the horrific imagery and enables many viewers for the first time to truly understand what transpired in Germany during and at the end of the war. Watching this presentation with an open mind will surprise you and leave you asking questions of your own.